Stefano Lupieri investigates these large groups which experience co-creation, fab labs or hackathons. He presents the InHome innovation cluster as one of eight new ways to innovate. “Carrefour, SEB, Kingfisher, Legrand, La Poste, Orange and Pernod Ricard scrutinize their shared client. New products easier to store, new services to the person… the InHome cluster devoted to mutations in the domestic life has given Carrefour no less than twenty tracks of concrete innovations. Ideas that the distributor would probably not had if its teams had worked by themselves. Because the principle of that cluster, piloted by InProcess consultancy, is to confront the lookout and analyzes of non-competing businesses around their “shared client”. For five sessions, participants watched movies describing new behaviors of consumers in their daily lives. What surprised many. They then devised solutions, especially on the best ways to reconnect all family members in the home. Each person being invited to give ideas for other sectors. “More and more companies understand the value of sharing knowledge with their counterparts for the emergence of new market opportunities,” says Christophe Rebours, founder of InProcess. Stefano Lupieri also investigates the Gutenberg project at Pernod Ricard, the AXA lab in the Silicon Valley, Renault’s Fab Lab, co-creation at Oxylane, the hackathon at L’Equipe, the venture capital fund of Suez Environnement and frugal innovation at Total. A beautiful cocktail to read here (in French) and in the “Special Innovation” issue of Les Echos. As an innovation ‘pure player’, the agency continues to help companies that want to make their business models evolve. Operating since the end of 2012 in China, InProcess is strengthening today its capacity to serve the Chinese market as well as the Western companies that want to deploy in China. With a domestic market of 1.3 billion people, including 475 million people who have a purchasing power equivalent to a Westerner and more connected people than the total U.S. population, China is a fantastic source of growth for the Western companies that can find the keys to this market. InProcess uses its unique methods of innovation, based in particular on the power of ethnography, to promote the emergence of innovations that naturally settle in the Chinese usages. InProcess now also develops its offer for Chinese companies that want to invent new models, new products or services tailored for the local or global usages. Vincent Leenhardt takes the direction of the InProcess office in Shanghai, which has moved into new premises to accommodate its customers in the former French concession. He is recruiting a Franco-Chinese team of professionals, specialized in human sciences and design. The entrepreneur, the adventurer of the XXI century? 350 growth entrepreneurs, economy change makers and politicians exchanged on this nice question with sociologists , artists and journalists over the last weekend at the 6th Spring Campus of CroissancePlus. Two significant developments have stimulated us a lot. First the good news: the perception of innovation as a non-technological act is increasing among French business leaders. Although the technology might be important in its implementation, the epicenter of innovation is indeed a matter of usages, and rarely of pure technology. Then, inspired by Bergson, the philosopher Raphael Enthoven put entrepreneurs in front of their humanistic responsibility: create new industrial and economic worlds, it’s good. But do good. Combining growth with meaning, making better growth seems to us at InProcess the essence of the innovation for and by humans that we advocate. A beautiful moment of stimulating discussions! We’re happy to participate in the Intersection conference, the world’s first international gathering of practitioners, managers and experts in the area of Strategic Design in the Enterprise. We will give a talk on The Experiential Revolution: designing an innovative model of growth Enterprise. Come and join us to exchange on innovation and business transformation by design, on the path to designing bold but harmonious business models, on altruism as a prerequisite for growth and on innovative, uninhibited and confident relationships between the enterprise and the society at large, for a fairer economy and world. Digital/physical convergence, retailer 2.0, new usages: retail is changing. Join us at the conference entitled “Re-Enchanting The Retail”, set up by Marketing Magazine to explore the evolution of the distribution in 2014. We will detail the benefits of the “shared client” notion. We will explore the crossed perspectives on this “client” for companies from various industries, with a view to bringing out innovation and creating value. Indeed, “our” client no longer exists since we share him simultaneously with several other companies. When he walks up the aisle of his hypermarket in search of cooking chocolate, while exchanging a chocolate mousse recipe on the phone, at that very moment he becomes the client of Carrefour, Nestlé and Orange all in one go. The study of shared clients between complementary companies opens the way for innovations that meet the clients’ true aspirations and that create higher value for all retailers. Be talenTED! 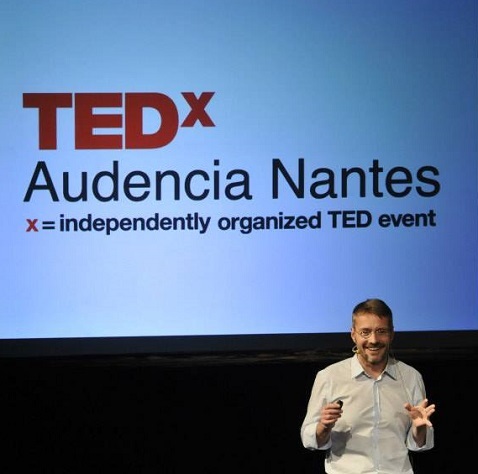 For its first edition, the Audencia Nantes TEDx conference highlights the talent. We are very pleased to announce that Christophe Rebours will propose a TEDx topic on the reconciliation of the enterprise with its talents and society at large. Because the company invented 200 years ago is reaching the limits of its model. Just like sciences, politics or our ‘living together’, it now starts its refoundation. The good news is that the company of tomorrow already exists. It is profitable. It stimulates growth. It is fair. It reconciles the society and the company. And France is one of the best countries in which it flourishes. Christophe Rebours will present a new model of company that settles an innovative, uninhibited and confident relationship between businesses, society and talents to build up fairer economy and world. Forget the regular surveys: they do not reveal the truth. Qualitative studies based on statements are unsuitable for understanding the lives of consumers. They are based on what they say they do but not on what they actually do. Why? Simply because they are carried out of the contexts of real life, and out of context, no one is aware of his behaviors. But to innovate, it is crucial to rely on the truth of today usages before designing new worlds. If declarative studies are unreliable, where will we find the raw material for innovation?